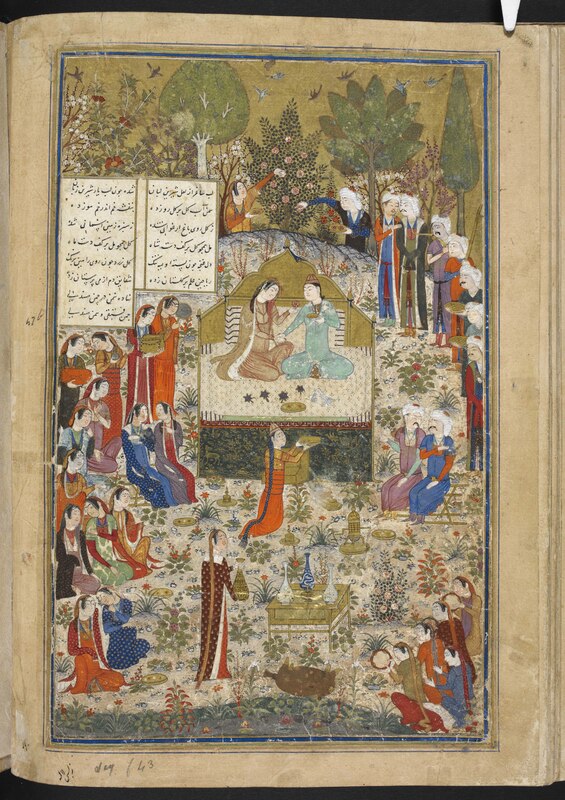 This exhibition is the first that the Courtauld Gallery has ever held devoted to Islamic Art. The raison d’être is the brass container, inlaid with silver and gold depicting scenes of court life. For many years it was not known what its intended use was but in this exhibition the idea of it being a shoulder bag or handbag is strongly put forward. It is thought that it is a “superior” version of textile and leather bags depicted in illustrations of the period and later, such as shown here. 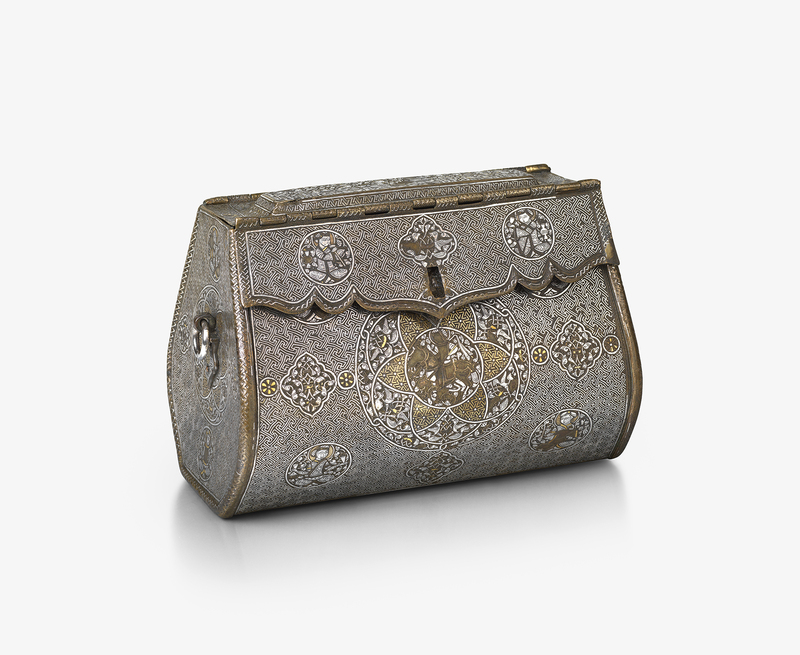 Because of the inlaid metal decoration the bag is thought to have been made in Mosul in Northern Iraq where there were metal workshops producing similar metalwork. Indeed this exhibition allows us to compare the bag with other items produced at Mosul. The inlay on the bag’s lid depicts a Court scene which is thought to represent the Il-Khanid Court. 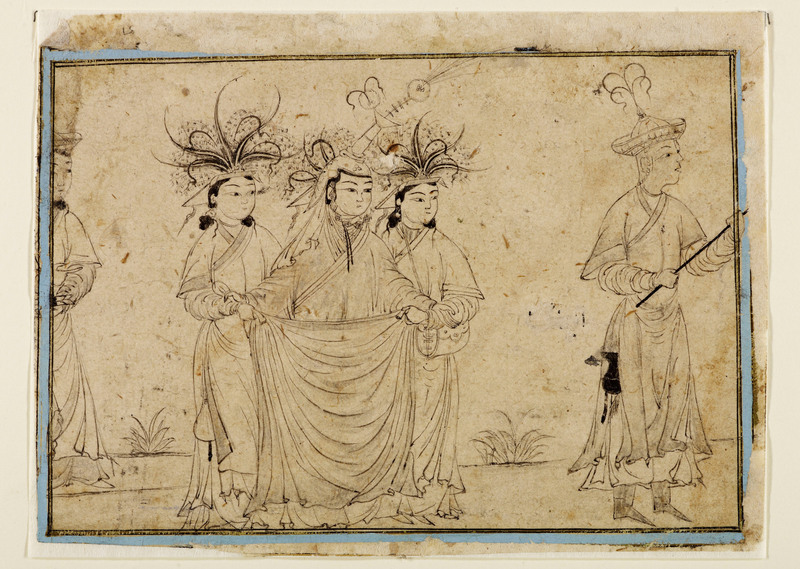 At the centre is a richly dressed couple surrounded by attendants and to the right of the woman is her page who wears her bag suspended across his chest. Nearby, to help set the scene in context, there is a group of objects similar to those depicted on the lid and these are a wide-ranging mixture which gives us a very good idea of the trading and cultural practices of this Court. I found this a really fascinating exhibition which sets the whole story in its time and culture. And as a Twenty-first century rider to this I was recently at an exhibition opening and during the event an obviously important Middle Eastern couple arrived and with them was an aide carrying the wife’s large handbag. This entry was posted in Asian Art, Ceramics, Decorative Arts, Glass, Jewellery, Silver, Textiles, Visual Arts, Works of Art and tagged Decorative Arts, Fine art, Islamic Art, Oriental art, Visual Arts.